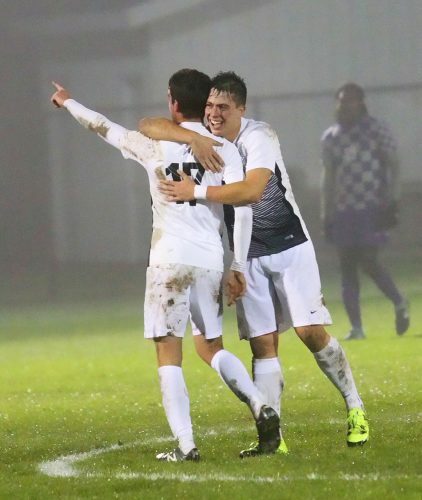 WINONA LAKE – The “Cardiac Kids” struck again on Saturday for Grace’s men’s soccer team. Marcelo Talamas sent the Lancers to the Crossroads League Tournament finals with a bicycle kick goal in the 89th minute, electrifying the 1st Source Bank Field crowd. The Lancers struck twice in the second half to beat Goshen 2-1 in the tournament semifinals, continuing what has become a magical season for Grace. Grace will travel to No. 21 Spring Arbor on Nov. 11 for the championship game. With a win at Spring Arbor, Grace would earn its second trip in program history to the NAIA National Championships. Despite holding a 24-3 shot advantage in the match, Grace found itself trailing the Maple Leafs (12-6-2). The Lancers (11-4-4) surrendered a penalty kick goal in the 34th minute to the Maple Leafs, and Goshen went into halftime with a 1-0 lead. Grace tripled Goshen’s shot attempts in the half (9-3), but only two of the Lancers’ tries were on target. Colin Cape nearly put Grace in front just two minutes before Goshen’s PK, but his rising shot clanged off the crossbar. The second half saw Grace present a near-constant threat at the Maple Leafs’ goal. The Lancers applied wave after wave of relentless attack at Goshen’s end with 15 shots. Goshen, on the other hand, absorbed Grace’s pressure as best it could, but the Maple Leafs generated zero shots over the final 45 minutes. The Lancers’ attack began to wear down the Maple Leafs, resulting in two Grace goals. The first goal from the Lancers came on a PK. Goshen was whistled for a handball in the penalty box, and Cape converted the spot kick to level the score 1-1 with 29 minutes remaining. Breno Oliveira and Cody Boerema had dangerous shots in the second half, but Goshen’s goalkeeper Johan Escalante proved his mettle with acrobatic saves. The game-winning moment came 90 seconds away from overtime. Oliveira sent a leading pass down the right sideline to Damon Binkley, who crossed a ball into the box. The pass fell to Boerema at the far post. Boerema’s close-range shot was saved with a spectacular block by Escalante. The blocked ball popped in the air in front of Goshen’s net, and Talamas took care of the rest. The freshman perfectly executed the bicycle kick, sending the Lancer fans into a state of bedlam as the shot rippled the back of the net. Talamas’s goal was his only shot of the match and one of the most important strikes in recent program history. Of Grace’s 24 shots, 12 were on goal. The Lancers, in addition to taking 21 more shots than the Maple Leafs, also held a 7-1 advantage in corner kicks.